Escape From the Scooby Doo Mansion: Pirates and squirrels... living harmoniously? This is from me mateys over at Office Pirates. Apparently some kind of follow-up to the old "you don't have to be nuts to work here but it helps" chestnut. 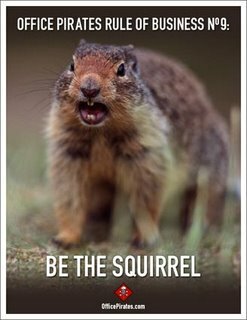 The problem is that I really, really hate squirrels. I mean squirrels piss me off almost as much as monkies amuse me. I don't want to be the squirrel - I want to kill the squirrel! Office Pirates obviously didn't do their post-graduate work at the same Institute of Advanced Pirate Studies that I did. I join you in your squirrel hatred although I'm not sure monkey's amuse me as much as you. 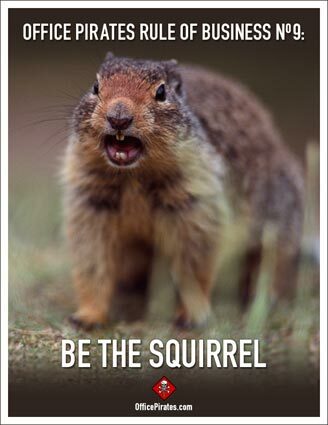 But if you ever have a need for a good squirrel hating session, I'm your gal!